The American population continues to mature with an impending "aging tsunami" just a few years away. It is projected that by 2050, the number of Americans 65 years old or older will increase to more than 83 million, nearly double its current population of 43 million (U.S. Census 2014). Public transportation provides freedom to much of the aging population who would otherwise be forced to give up their lifestyles. Critics of publicly funded transportation argue that many members of the aging population would be better off relocating to larger communities where desired services are more readily available, while public transportation proponents believe it is more desirable for aging Americans in small urban and rural areas to remain in their homes and utilize public transportation. This study's objectives are to determine the current state of aging in place in small urban and rural settings throughout the country and quantify the costs for residents to live at home and ride public transportation versus moving to an assisted living facility. Overall, simulation results show that the cost of assisted living is almost always higher compared with other alternatives. Homeowners without mortgages have the lowest costs, followed by apartment dwellers and homeowners with mortgages. Policy makers should consider the potential cost savings from aging in place found in this study. Seniors and their families can potentially save thousands of dollars annually by remaining at home and utilizing home health and public transportation services. Policies that increase the availability and accessibility of public transportation should be considered, as these will increase the likelihood of seniors aging in place and utilizing important amenities within their local communities. 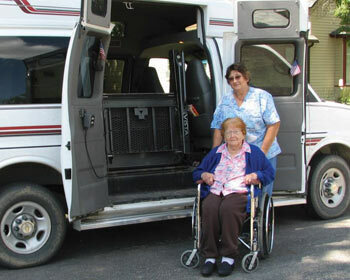 Without available transportation, many seniors are forced to relocate well before they either want to or have to, due to poor access to services. Because 90% of older adults want to age in place while 80% plan to live out their lives in their current homes, (Farber et al. 2011), the emotional cost of moving before it is entirely necessary should also be considered. Change can be difficult, especially for seniors who have often lived for decades in the same small urban or rural community and highly value their friends and available services. They want to continue to support their local communities. Policies that not only save important financial resources but also assist in allowing older adults to remain vibrant and active should be considered.